John Brothers Automotive (Your Specialty Vehicle Store!) 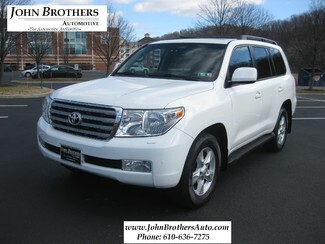 Presents This Magnificent And SUPER CLEAN- 1-Owner 2009 Toyota Land Cruiser! A Rare Find With Good Low Mileage, This 1-Owner LandCruiser Is In Great Overall Condition Both Inside And Out And Looks Absolutely Stunning In The White Exterior Over Sand Beige Interior. This Vehicle Has Been Properly Inspected And Freshly Serviced On Site, In Our Service Department. The Condition Of This Toyota Provides Evidence To Its Well Kept History. This 4x4 SUV Runs And Drives Superb, And Comes With A Long List of Equipment, Amenities, And Capabilities-- Making It A Proven And ULTIMATE Full Size SUV. This LandCruiser Was Fitted With The Optional "Upgrade Package" From The Factory! An Over $7,000 Option When New That Includes-- Navigation, JBL Premium Sound System, Rear Entertainment, Interior Wood Trim, Center Console Cooler Box, Rear Entertainment System, And MORE. OUR SMALLER SIZE, WITH LOWER OVERHEAD- ENABLES US TO OFFER NO HAGGLE AND VERY AGGRESSIVE PRICING OF PREMIUM GRADE HAND PICKED SPECIALTY VEHICLES --- ALONG WITH PREMIUM LEVEL DETAIL ORIENTED SERVICE! We Continue To Earn The Loyalty Of Luxury And Sports Car Buyers Nationwide. Shipping Is Available To Your Door, And Finance Options Are Available Through JJBEST Bank And Woodside Credit For Those Who Qualify.